001 180-9 at Munich Ost having worked the final 'Nicholasfart' special of the day. The sunshine didn't last! Flew Heathrow - Munich with Lufthansa taking the very long way to Heathrow Airport via Paddington as the local airport bus timetable has been changed enough to make it next to useless for me to reach the airport for any morning flights. Arrival at Munich was only slightly delayed but escaping from the Flughaven took much longer than I had hoped (it's massive!). After waiting nearly the full 15 minutes I was on an S-Bahn to meet my friends who had already arrived from Manchester at Munich Hbf. classmates through Munich Ost with a 'piggyback' train. 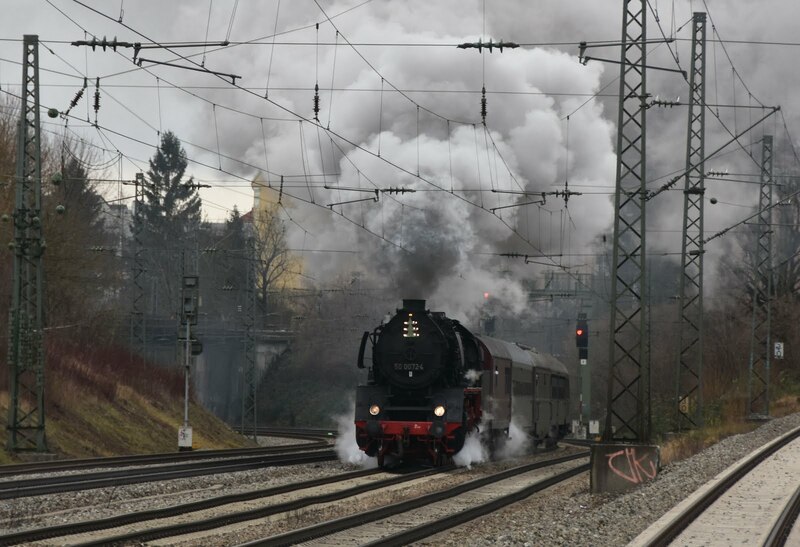 The first surprise of the trip was from the S-Bahn window shortly before Johanneskirchen where a steam loco was briefly sighted in steam and looking as though it was ready to turn onto the S-Bahn line. A quick look at Google Maps and a few calls to my friends (who very much like their steam) and a plan was hatched to meet at Munich Ost and chase the train. An educated guess was made that it would probably pass through Munich Ost and upon my arrival there I found another enthusiast. 'Do you speak English' 'No'- so I try anyway, to no avail. The others arrive and a few more shouts of 'Dampflok' appears to explain our pursuit, and confirms that the other spotter is waiting for the steam also. Duly it appears in the sun soaked platform and we get some worthwhile shots. 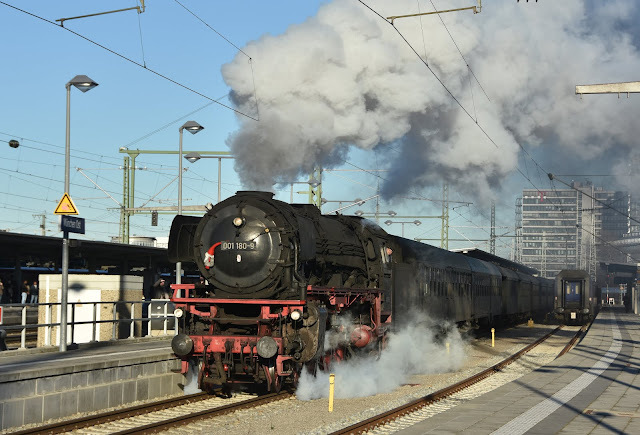 It is also ascertained that a series of Santa Specials (or 'Nicholasfart'- a term we all found very amusing) are being run by the Eisenbahn Museum Beirichts across the weekend. 001-180-9 which we had seen this afternoon would be empties back to the depot now but would be back for more work in eh coming days. Something to remember for later in the trip. A bonus Rabbit! 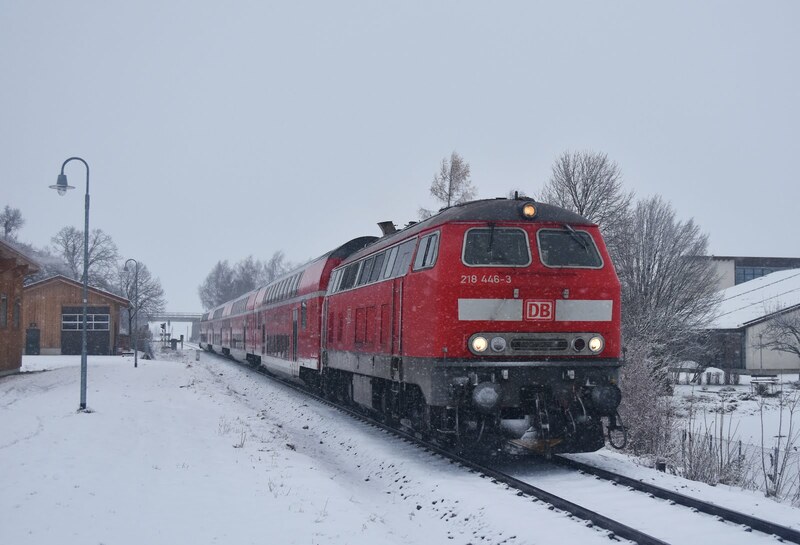 DB Netz 218 477 passes with a test train. Pleased with the haul it is time to get some late lunch, check in at our Hotel (taking OBB 1116 087 across from Ost to Hbf) in the process and even visit the model shop on platform 11 before looking for our first rabbits of the trip. 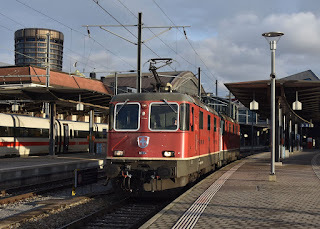 My target was to finally get a ride to Muhldorf with a 218 and the best option is to take the first evening train the 17:05 which produced winning locos 218465 and 218428. 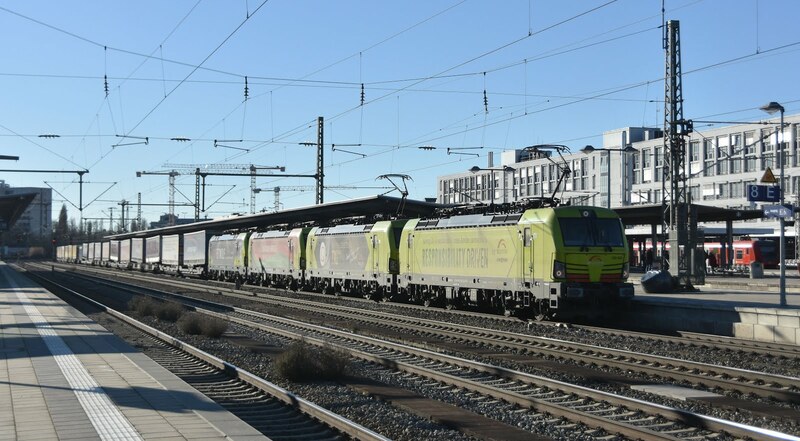 Just before departure there was time to check that nothing too mega had dropped onto the 17:10 vice turn to Kaufstein- Vectron X4E 664 had the honours. 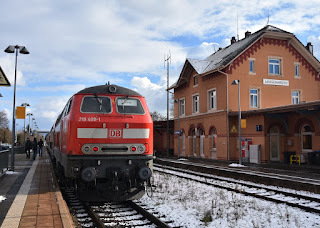 The Muhldorf train was taken as far as Ampfing where I realised a cunning plan to drop back onto the 17:21 Munich - Simbach with 218423 and 218452. 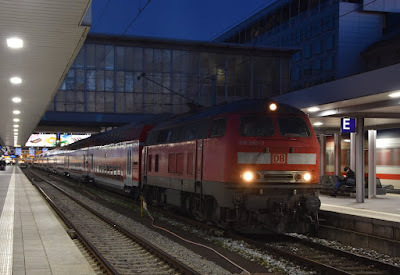 This allowed a connection into the 18:42 Muhldorf - Munich with far less interesng but never the less required 245009, this being the last loco hauled departure back to Munich from Muhldorf. 218 465 prepares for departure with the 17:05 Munich Hbf - Muhldorf. Back at the Hbf it was very clear that the old 115 locos were no longer working the sleeper ECS, OBB having found it's own locos to use instead on the NightJet. As for us it was time to retire to dinner, a great meal and atmosphere as ever at the Augustiner Brauhaus. Here a fun game of 'smuggle as many beer mats as we can into James' pockets' began. I guess it was my own fault for saying that I already had one and therefore really didn't need anymore. Coming home with a stack of beer mats was to become a recurring theme. Snow is falling heavily as 218 466 approaches Seeg on the Fussen branch with the 11:52 Munich Hbf - Fussen. 06:29 from Kaufstein on the Meridian vice turn. It was an early start for our one chance to cover the Kaufstein morning vice turn. Fortunately despite quite a few beers and a late night all were out of the hotel present and correct to head over to Munich Ost (even if the other two didn't really get why we were doing it). No heritage electric which would have been the best outcome- but we did score a very shiny 193771. Almost light by our arrival at Hbf (this train really is pretty nocturnal in December) and time to find a fill in before heading down the Fussen branch. 111 183 took us to Reichurtshausen for 111 057 back with a quick spin on the Treuchtlingen turns. 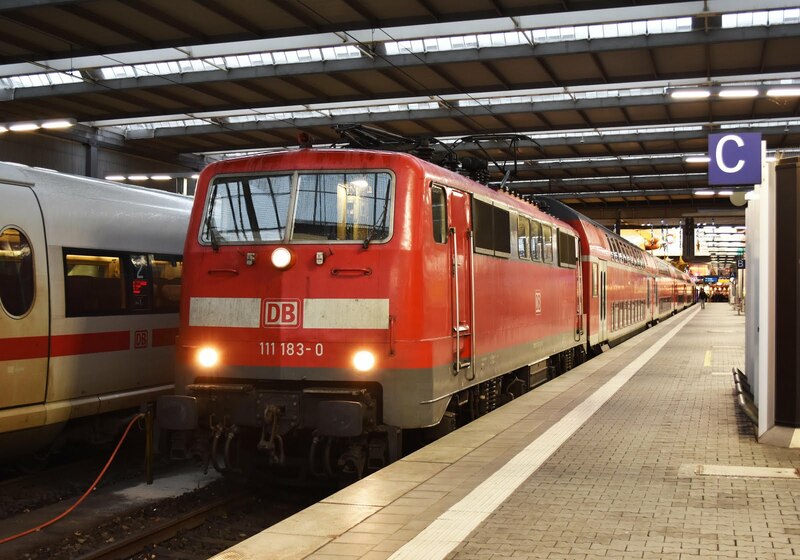 111 183 at Munich Hbf with the 08:22 to Treuchtlingen. A far cry from the beautiful sunshine of the day before the weather had turned quite unpleasant- cold and wet with very little daylight- by the time we reached Buchloe with 218 414 on the 09:52 to Fussen the precipitation was falling as snow and by Fussen there was a reasonable amount of it in places. The train was very busy with tourists including a couple of American ladies who didn't seem too hot at standing up on a moving vehicle- A lot of Americans just don't get trains!). By diagram the next two trains on the branch should also have been rabbits and they were in the form of 218 420 and 218 446. I had hoped to visit Neuschwanstein castle in the afternoon but my friends were 'absolutely not' interested- and the weather was not really the best for it either. Instead we whiled away our time in the pretty town of Fussen exploring the castle, the Christmas Market and several beerhouses (acquiring several beer mats that I 'didn't need' on the way). Following the earlier flurry of Rabbits on the line the next departure from Fussen wasn't until 18:06- we left the beerhouse in plenty of time for this and were rewarded with 218 415 to Munich. Tried to eat/drink in the Hof Brauhause in town but after 10 minutes of wandering around aimlessly looking for a table we gave up, instead landing in the Augustiner place over the road where we very fortunately found a table just being vacated. Dinner ended up being a (very nice) kebab wrap! EC195 13:09 Zurich - Munich is powered through a snowy Hergatz by 218 419 and 218 422. 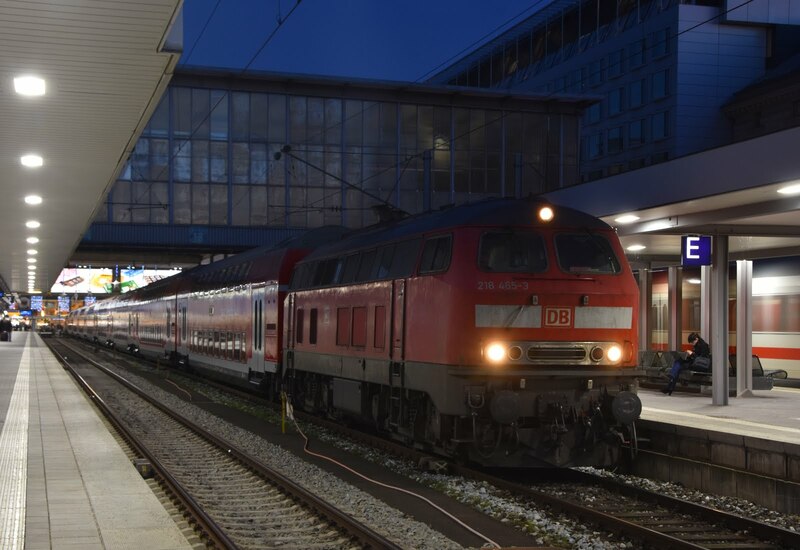 Note that SBB panoramic coaches have now appeared in the consist of Munich - Zurich trains, displaced from the Gotthard route. Today's target- more Rabbits, though after the success of the previous two days it was about time things got a little more complicated. 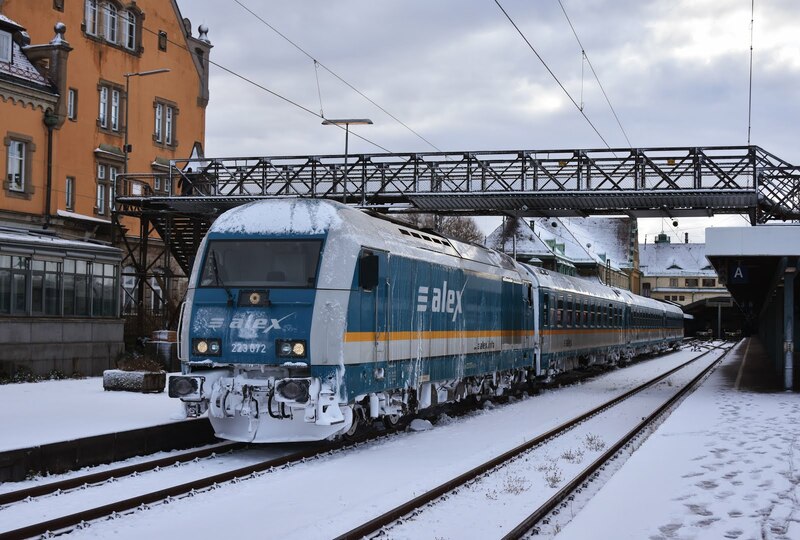 A snow encrusted Alex 223 072 at Lindau. 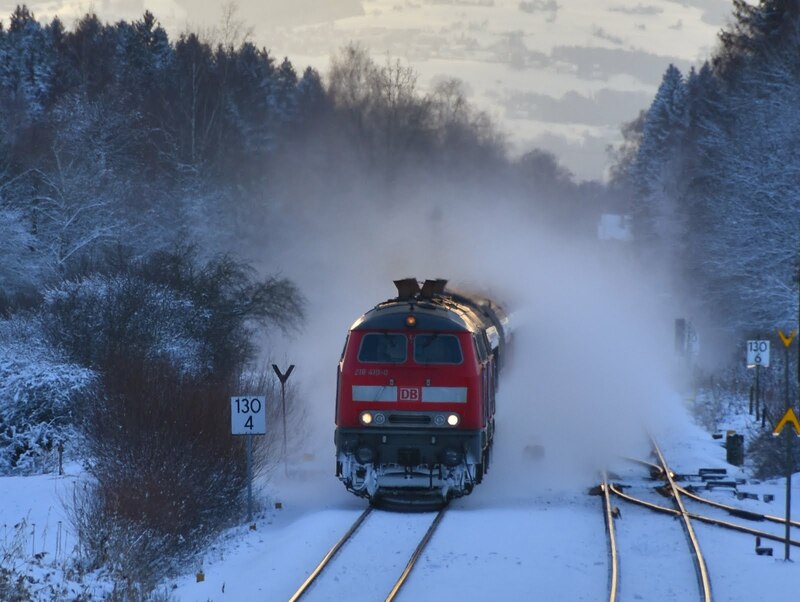 It was another cold and earlyish start for the 07:14 EuroCity to Zurich which produced required pair 218 421 and 218 433. After a quick snowy photo stop at Buchloe we met another enthusiast, Michael, who would travel with us as far as Kempten (heading towards Oberstdorf) while we would continue with the pair right through to Lindau to pick up the Ulm-Lindau axis. 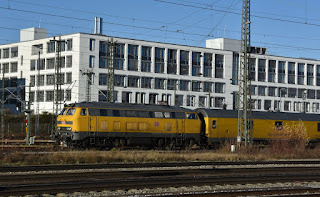 245 036 works the 10:05 Lindau - Stuttgart (to Ulm). 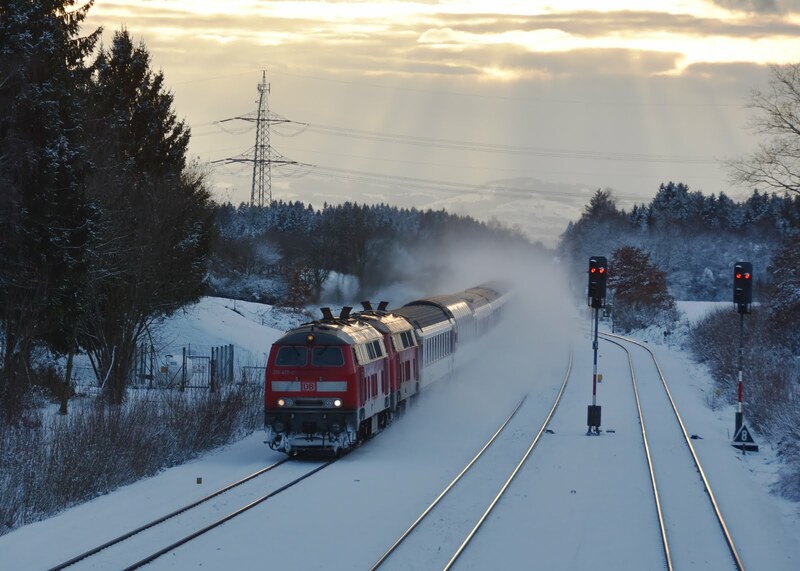 There had been a lot of snow on parts of the Allgaubahn and we were keen to get photographing, particularly as the sun had made an appearance on the southern part of the line. We were a few minutes late into Lindau (421 383 taking the EC on to Zurich) through no entirely descernable reason- and so was everything else. This did at least mean we made the connection onto the 10:05 towards Stuttgart as it had not yet arrived. When it did it was 245 036 at the helm which was a little disappointing. 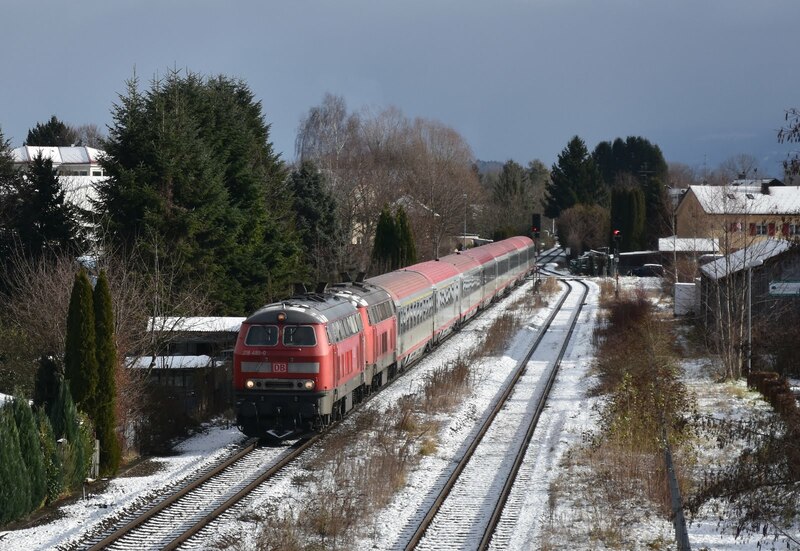 218 409 pauses at Langenargen on it's way to Lindau. 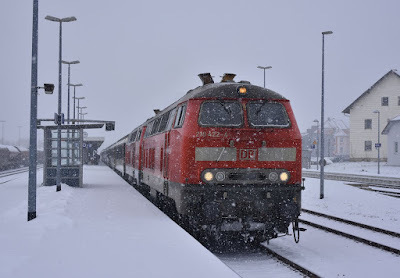 We took the 245 through to Ravensburg, the snow diminishing the further along the route we got. Unfortunately the next train back to Lindau eventually turned up around 20 minutes late due to signalling problems. Back at Freidrichshafen while 218 436 was running round on the delayed 11:05 Linda - Stuttgart (presumably a failed DVT) our train with 218 427 was terminated. All passengers forward on a single coach class 650 DMU through to Lindau! It was a little busy! 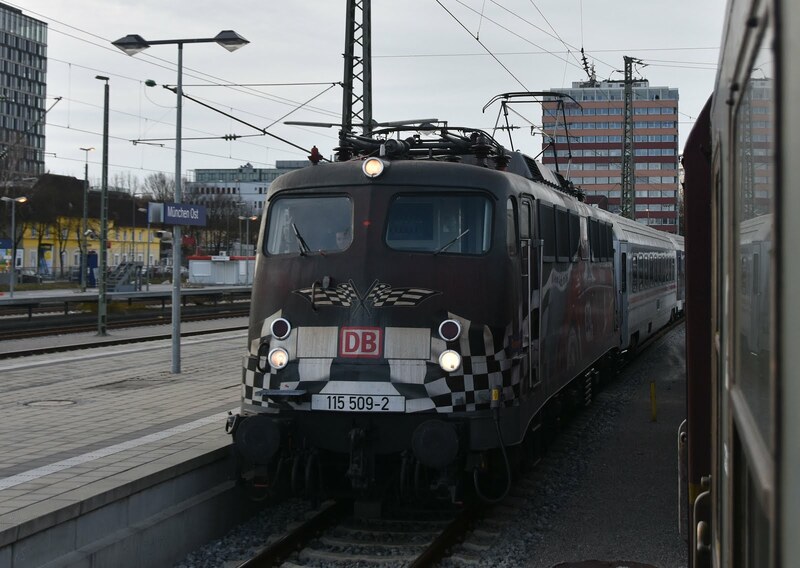 Fortunately a new move was quickly planned, to photograph 218 495 and 218 343 at Langenargen on the OBB EuroCity before then taking 218 409 on to Lindau on the next train from Stuttgart. Sunshine and snow! 218 495 leads 218 343 towards Langenargen with IC118 08:54 Innsbruck- Munster. 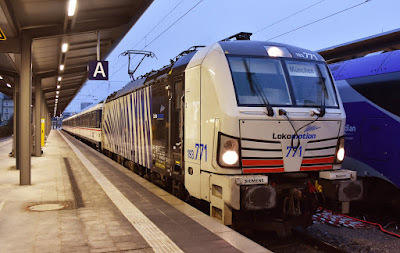 Dispolok liveried ER20-007 departs from Hergatz with a Lindau bound Alex. 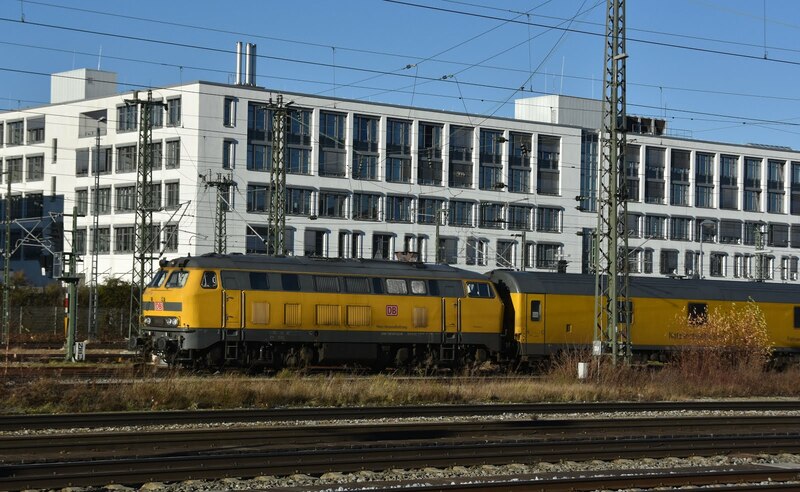 Back at Lindau I was surprised to see OBB 1144 250 in the stabling point as I have not seen this class here before. 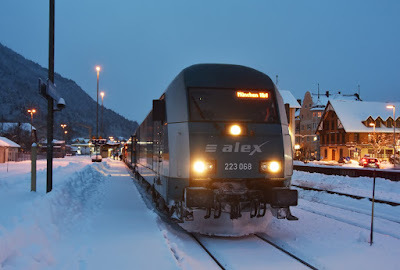 In search of some proper snow Alex 223 069 was taken back onto the Allgaubahn to Hergatz with plenty of time to seek out a snowy location for the next southbound EuroCity from Munich. DB however had other ideas- while we had walked out onto the single line towards Memmingen the train simply did not appear. 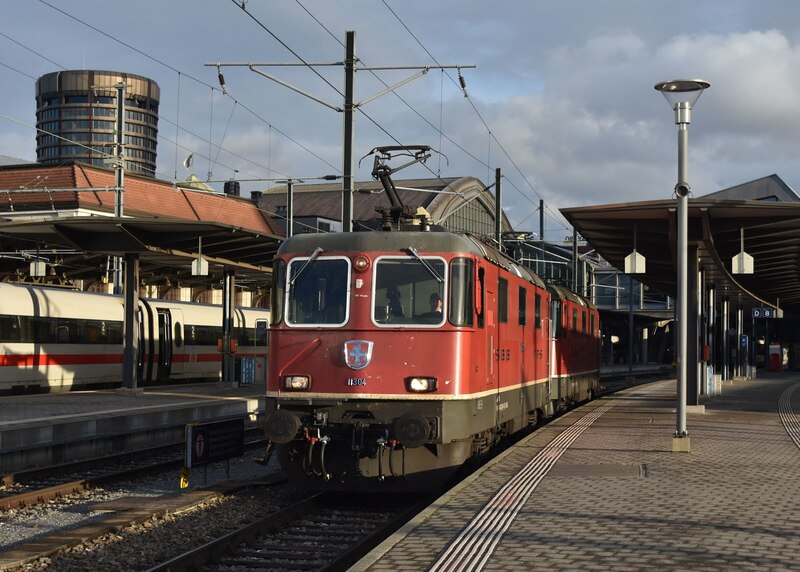 Only when one of our group decided to look up the trains progress online did we realise to our horror that it was no longer calling at Memmingen, made an additional stop at Kempten and had therefore already passed us on the other route! We weren't very impressed. A few other photos were managed at Hergatz- but not what we were really looking for. 223 068 arrives at Hergatz to take us back to Munich. All in all we were fairly pleased when 223 068 arrived to save us and take us back to Munich. I still quite enjoy the 223's and the Alex stock is good fun with a compartment to ourselves most of the way to Munich. 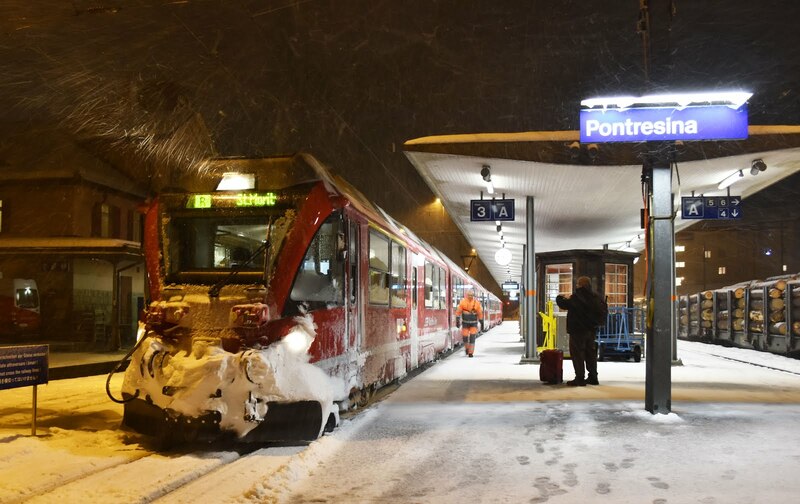 A slight further delay was encountered at Immenstadt attaching the portion from Oberstdorf (which was worked in by another 223)- possibly explained by more than 1ft of snow. I can't remember where we had dinner- but it was a beer house and it was good! 50-0072-4 powers towards Munich Heimerenplatz with its circular excursion. Following our unexpected encounter with the Dampflok on Thursday there was an obvious plan for today- have a ride on the 'Nicholasfart' around Munich which I believe cost the princely sum of 16 euros (though nobody ever came around to charge us). 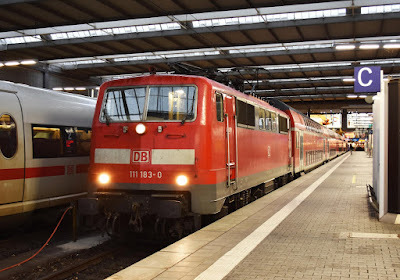 The train arrived into Munich Ost with both locos and a double set of stock ready to split and for two trains to head around Munich, 001-180-9 was to head anti-clockwise, while 50-0072-4 lead the other set of stock clockwise. Shortly before departure from Munich Ost with 50-0072-4 there was the surprise arrival of 115 509 in some sort of racing livery on a set of IC coaches- no idea what it was doing! 115 509 at Munich Ost. Having done the loop around Munich in around 40 minutes, including the spectacle of passing the other steam train 3/4 of the way around we then headed to Heimerenplatz to photograph the next pass of the steam. A few freights were also seen before it was time for me to split from our group, the others of whom were flying home that afternoon. My own move was to head to Munich Hbf for the 12:33 EuroCity to Zurich. I had worked out that this would be the other pair of weekend EC Rabbits to those taken the previous day- This produced required 218 422 and 218 419 as expected. Snow was falling again by Buchloe and again I was joined by Michael who was taking the train down to Lindau. I wasn't sure if I was going to continue straight through to Munich or go for another go on the Ulm-Lindau axis. The decision was simple- it was raining, the weather was cold and horrid and the next train to Stuttgart was delayed. 421 394 therefor took me into an increasingly slushy Switzerland. My hostel in the outskirts of Zurich was nice enough- I cannot say the same for the walk into the city which turned out to be much longer than I had thought, and also much wetter. By the time I reached the city I was pretty frozen and soaked right through, and not really any much clearer where I was going to find dinner. Eventually settled on a Pizza restaurant within Zurich Hbf which served up a decent dinner. I was pleased to get back to the hostel, warm up and get to bed. Ge4/4ii 613 at Davos Platz waiting for it's next journey on to Filisur. Ge4/4ii 615 at Chur- base level of the RhB. Fortunately my clothes and shoes had dried out overnight and I made my way down to Zurich Hbf for 460 104 on the 09:37 to Chur. This trip was really intended just to be a reckie of the RhB and it took me a little while to get my bearings (and find some lunch) at Chur. If it helps anyone eles- don't go into town looking for lunch- go to the station Subway. I didn't find this until much later. The weather was once again pretty horrific with rain falling heavily even at altitude. I missed a couple of RhB services and then got distracted when Re4/4 11151 arrived on an old push/pull set. This turned out to be vice ICE. Another similar set (!) appeared for the next departure a regional service with 11136. I took this to Landquarts on the 12:16 Chur - Zurich loosing even more time on the RhB in the process. 11151 was to follow on the 12:39 'ICE' departure for Hamburg. 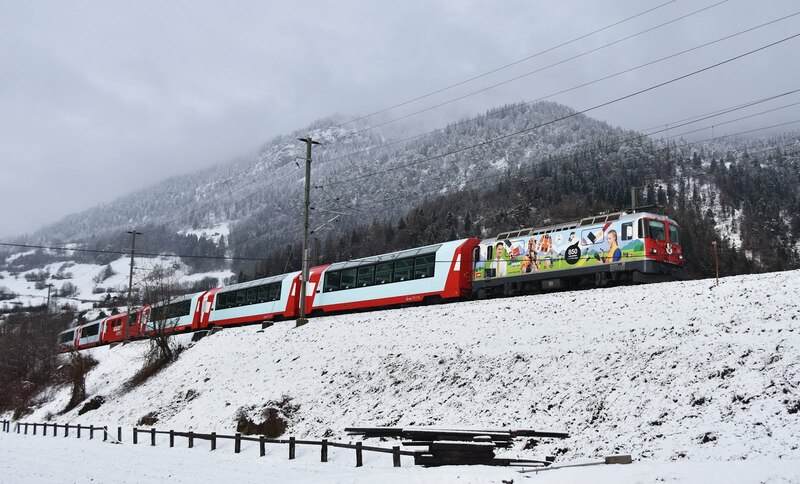 Ge4/4iii 650 is bound for St Moritz at Filisur. With half the day gone already I finally got onto the RhB taking Ge4/4ii from Landquarts to Davos, and then after a wait on to Filisur. There was a bit more snow at this altitude but still it was raining heavily and was quite miserable. The plan (there wasn't really a pre-planned plan) was to drop my luggage at my hotel at Filisur at this point and check that the restaurant would be open in the evening- however because of the connections at Filisur that would have put me back an hour and I had already wasted quite enough time- so onwards I went with Ge4/4iii 650 to Samedan on a St Moritz service. Passing through the Albulatunnel finally came a change in the weather, from rain to snow. It made photography even more challenging but at least a little more interesting. Continuing to avoid units my next move was to take Re4/4ii 630 to Pontresina. Finally locos gave way to an Allegra railcar (though still hauling some traditional coaches which I chose to take and a wagon of logs) for my final leg from Pontresina to Alp Grum - having reached the highest point on the line and with darkness definitely now descended it was time to re-trace my steps to Filisur. Conditions up at Alp Grum were certainly interesting, several feet of snow and pretty much a blizzard- the solid station building definitely providing a welcome refuge. The on train announcements describing the view did seem somewhat superfluous. 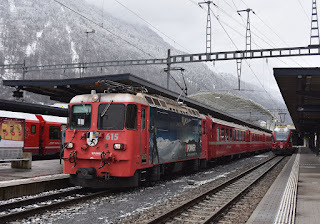 Re-tracing my steps back to Filisur was behind another Allegra unit attached to an Alvra trailer unit to Pontresina, Ge4/4ii 627 then took me forward to Samedan for Ge4/4iii 652 back to Filisur. 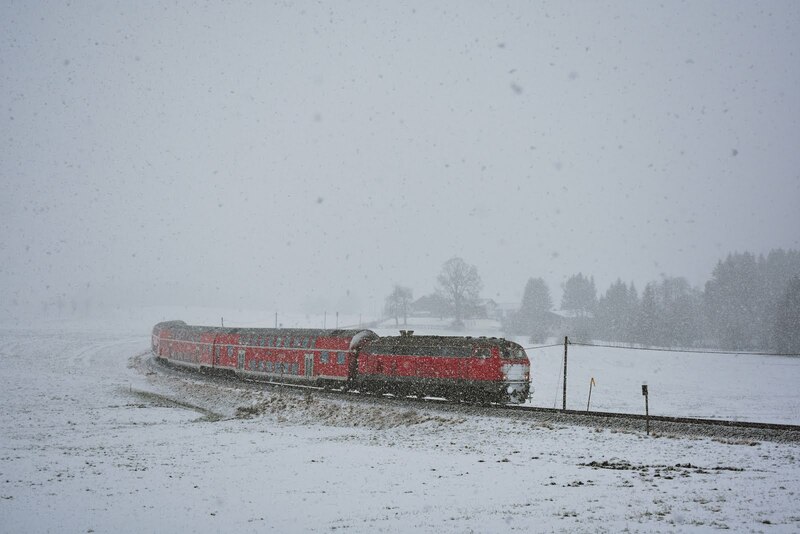 Snow is still falling at altitude- Allegra EMU 3505 pauses at Pontresina. Fairly soaked (it was still raining heavily rather than snowing in Filisur) and in the dark I did eventually find my hotel- only to find the door locked. Eventually after a bit of knocking and trying the phone number on the door several times I was let in. Clearly the hotel was not busy as I was upgraded to a room with an en-suite bathroom- I also took the time to check that the restaurant was open. Having walked past I secretly already knew the answer- it wasn't. And nowhere else was either. I think I may not have sounded entirely grateful when I was offered a pot noodle and a kettle and told once again that nowhere else was open. Unperturbed I deposited my gear and went for a final soaking just to prove that nowhere else was open. It really wasn't. I supplemented my pot noodle with a drink, cake and biscuit from the station vending machine. Not really the end to the day and the last meal in Switzerland that I had been hoping for! 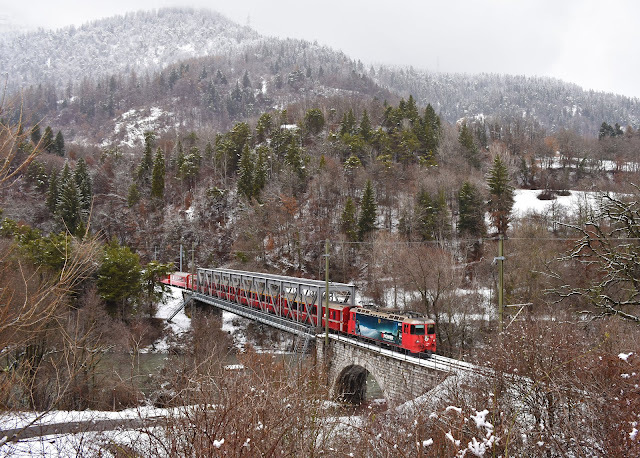 Ge4/4ii 615 heads towards Reichenau with a train from the Disentis line. 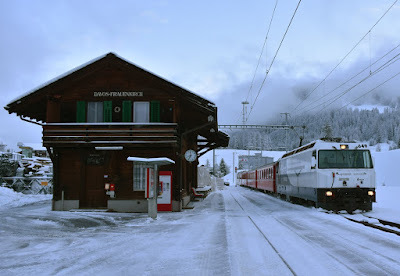 Ge4/4iii pauses at Davos Frauenkirch with a train to Filisur. The weather forecast on my phone had been correct and at some point overnight the rain had turned to snow and I woke up to the sound of the roads being ploughed. Snow was not falling when I awoke but that wasn't the end to the weather problems. I had an hour or so to burn before the Coop opened and I could get some breakfast so I took the train to Davos with traction provided by one of the railmotor vehicles. As we climbed the fog which surrounded Filisur lifted and the weather actually looked like it might have been Ok- a few patches of blue at this altitude. 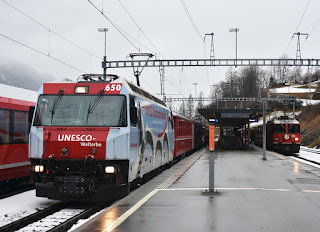 I photographed and rode the next train back to Filisur for breakfast behind Ge4/4iii 649. Ge4/4ii 611 approaches Reichenau with a Glacier Express. The plan after breakfast was to walk to the Landwasser viaduct, but visibility had further reduced and frankly efforts would have been futile. Instead I gathered my things and made my way down towards Chur on the line I had yet to cover hoping I could find some attractive spots in the snow to get some photographs. 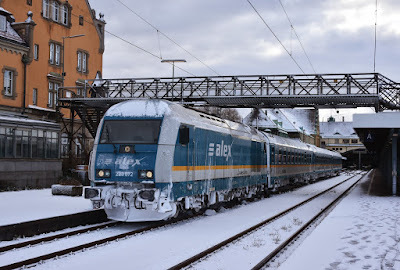 My train was an Allegra/Alvra set again and ultimately was taken all the way to Reichenau-Tamins where the weather was better and there should be more trains (I was very conscious of my flight back home from Basel at 17:00). I found a spot that was reasonable and photographed a couple of trains, including freights lead by Ge6/6ii's 703 and 704. In waiting for a shot of a train of the Disentis line I ended up with a run of almost epic proportions to make my train back to Chur for the onward connection I planned to make - the 12:39 ICE (incase it was a scratch set again). 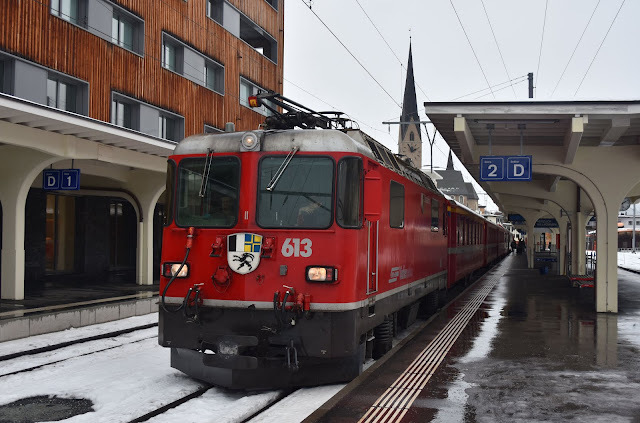 I did make my connection- just and also had time to cover the RhB between Chur and Landquarts to pick up my mainline train from there. 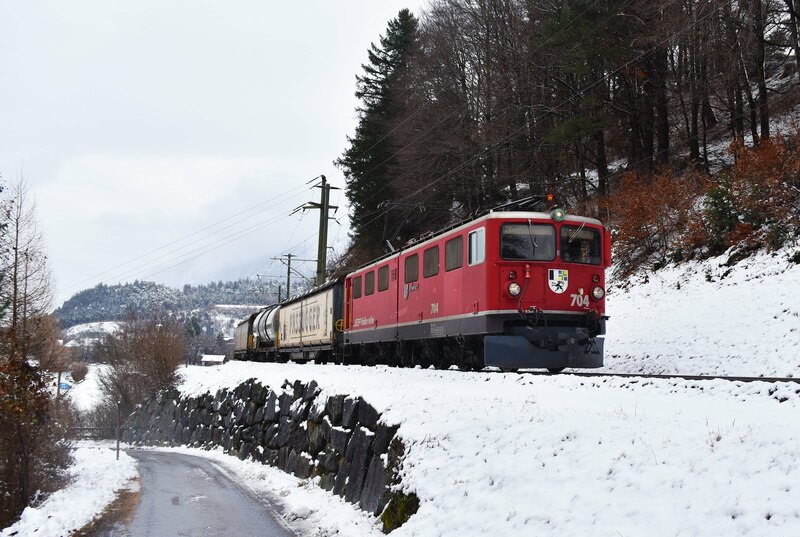 Doing the honours was Ge4/4ii 615 on a Klosters service. 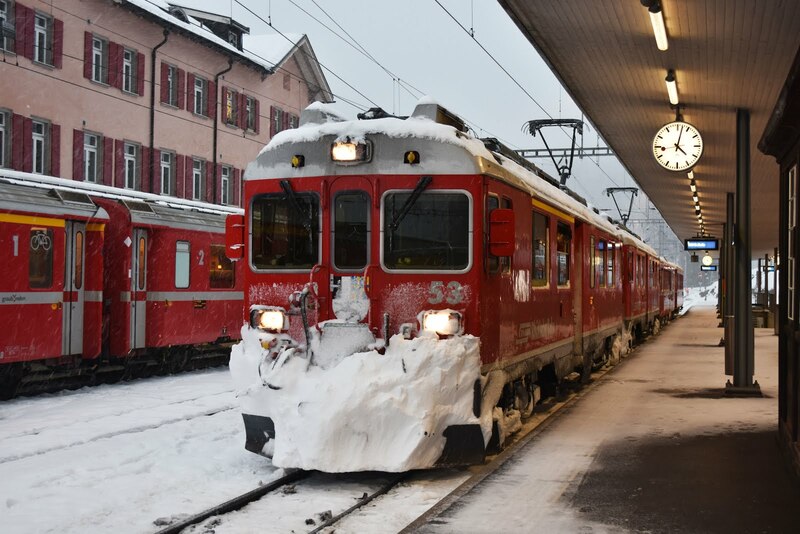 Of course the ICE was actually an ICE today but did give the chance to bail off at Zurich for an alternative loco-hauled service on to Basel, this turned out conveniently to be the 14:08 from St Gallen to Basel which was already in the station and was worked by Re4/4ii's 11304 and 11156 in tandem. The sun had finally come out by Basel so I did manage just one sunny picture of the Re4/4ii's detaching from the train! Off to the airport for a painless return to Luton with EasyJet. 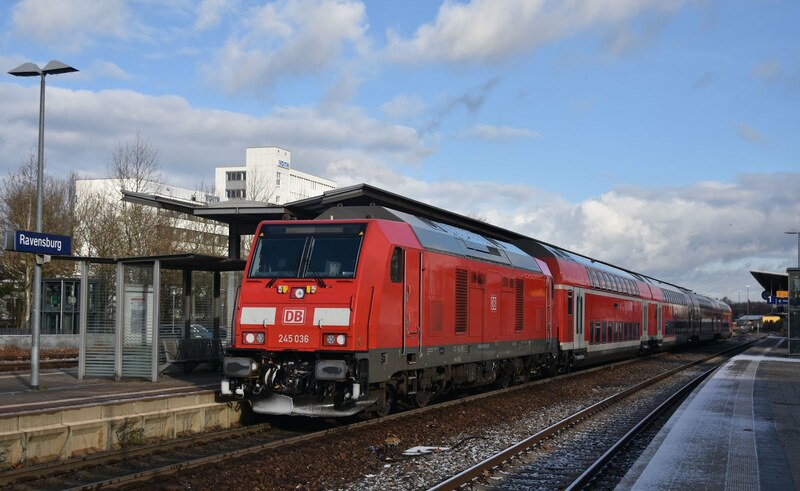 Hergatz with a Zurich - Munich EuroCity. 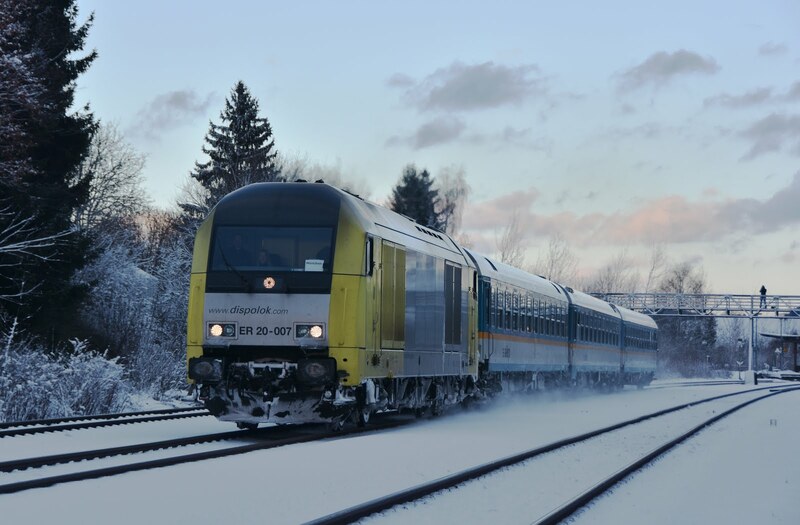 Rail trips in December are always going to be risky- especially if you are coming for photography! Two of my main aims in Germany were to cover the lines to both Muhldorf and Fussen with 218's as I had failed to do so previously. This was achieved and a good number of winners were had as well. Of course Munich is a good city to spend Christmas evenings in with beerhouses and the Christmas markets. We weren't really expecting to see snow here so that was a bonus- though some brighter skies would of course have been lovely. 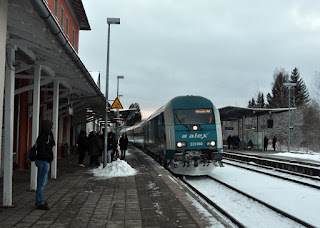 I still intend to come back to this area- most likely in the summer and with a car as there are plenty of great spots on the Allgaubahn as well as the Fussen and Oberstdorf branches. Snow is around 2ft deep at Immenstadt wih Alex 223 063. This was my first visit to the RhB and what a fantastic railway it is. I feel I have got a feel for how the network works now while my stock of photos lacks behind somewhat due to the weather I experienced. 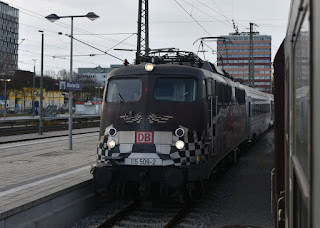 I know I will be back on the Rhatiche Bahn before too long- especially with a substantial EMU order currently being built which will inevitably eradicate a lot of the more interesting loco hauled trains. Travel was on FIP coupons throughout and no problems were encountered. 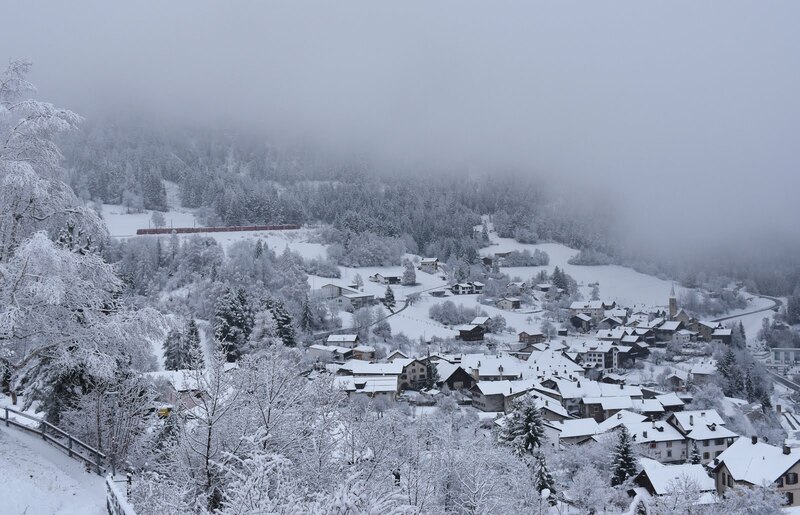 Cloud is closing in on Filisur as a St Moritz - Chur train appears on the hillside.